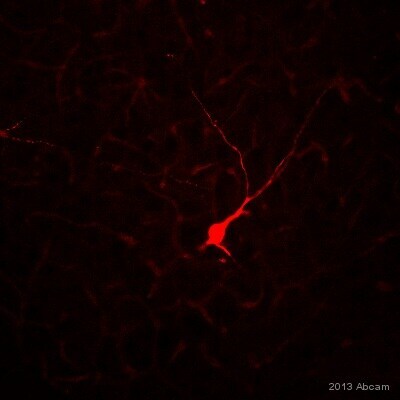 This antibody recognises the monomer version (110kDa) and the dimer (220kDa) of Metabotropic Glutamate Receptor 2+3. 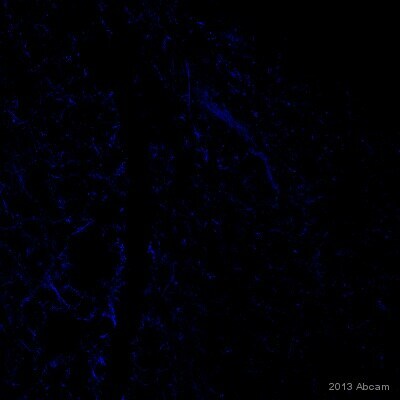 This antibody was raised against a synthetic peptide corresponding to the 13 c-terminus amino acids of mGluR2/3 with an N-appended lysine coupled to thyroglobulin using glutaraldehyde. Our Abpromise guarantee covers the use of ab6438 in the following tested applications. WB 1/1000. 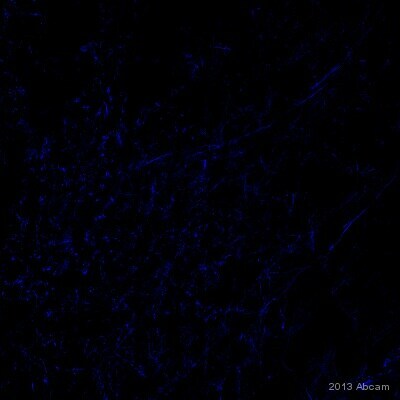 Detects a band of approximately 100, 200 kDa. L glutamate is the major excitatory neurotransmitter in the central nervous system and activates both ionotropic and metabotropic glutamate receptors. Glutamatergic neurotransmission is involved in most aspects of normal brain function and can be perturbed in many neuropathologic conditions. The metabotropic glutamate receptors are a family of G protein coupled receptors, that have been divided into 3 groups on the basis of sequence homology, putative signal transduction mechanisms, and pharmacologic properties. Group I includes GRM1 and GRM5 and these receptors have been shown to activate phospholipase C. Group II includes GRM2 and GRM3 while Group III includes GRM4, GRM6, GRM7 and GRM8. The activity of GRM2 and GRM3 receptors are mediated by a G-protein that inhibits adenylate cyclase activity. 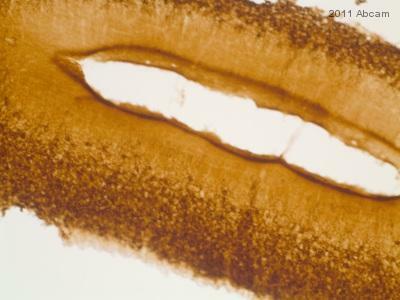 Immunohistochemistry (Frozen sections) - Anti-Metabotropic Glutamate Receptor 2+3 antibody (ab6438)Image courtesy of an anonymous Abreview. 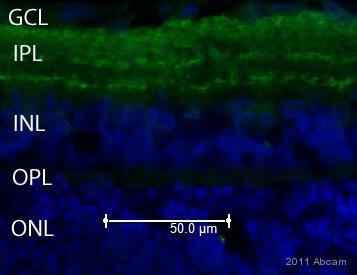 ab6438 staining Metabotropic Glutamate Receptor 2+3 in rat retinal tissue by Immunohistochemistry (Frozen sections). Tissue was fixed in paraformaldehyde, blocked using 10% serum for 20 minutes at 24°C, then incubated with ab6438 at a 1/100 dilution for 16 hours at 4°C. The secondary used was an Alexa-Fluor 488 (green) conjugated donkey anti-rabbit polyclonal, used at a 1/1000 dilution. Counterstained with Hoechst 33258 (blue). 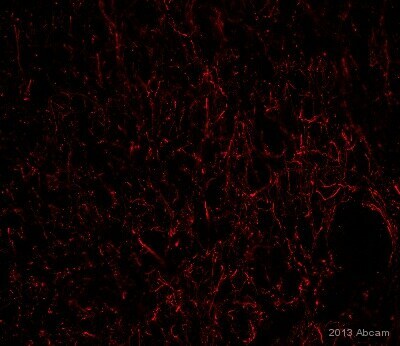 ab6438 staining the Metabotropic Glutamate Receptor 2+3 in Chicken brain tissue sections by IHC-Fr (Frozen sections). Tissue samples were fixed with paraformaldehyde and blocked with 5% serum for 1 hour 30 minutes at 20°C. 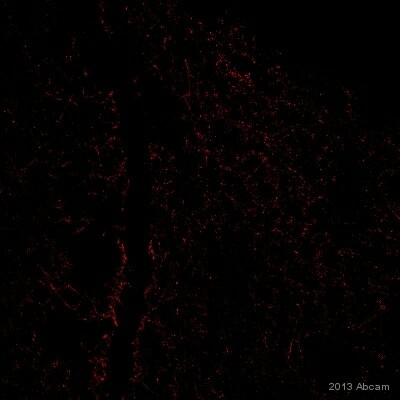 The sample was incubated with primary antibody (1/100) at 4°C for 8 hours. 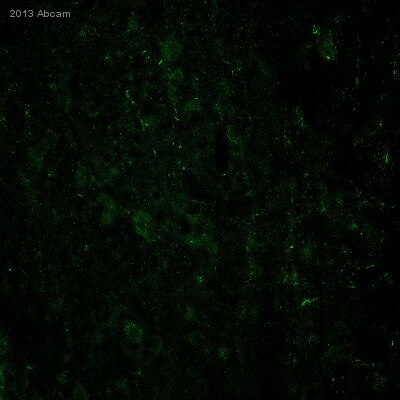 Ab6720 (1/400) was used as secondary antibody. Publishing research using ab6438? Please let us know so that we can cite the reference in this datasheet. Do you have blocking peptides for these MGLUR2/3 and MGLUR1 antibodies?